It's Friday, so I'm linking up with Kate Matoung for Five Minute Friday. We receive a one-word writing prompt and get to write for five minutes. Since I've ventured back into the blogging world, it's good practice for me to write on the fly. Our word prompt for today is FLY. We've just finished up another school year. I teach the youngest class of preschoolers. The lifecycle of the butterfly is always a fantastic teaching experience in the spring. The students learn about caterpillars and how they eat and eat and grow fat. They are not very attractive at this time. They form a cocoon or chrysalis around themselves. We have a mesh butterfly netting in our classroom so the little ones can observe this process. We watch each day and finally, a butterfly emerges. A beautiful butterfly! I ask my students if butterflies are supposed to stay in this cage. They shake their heads no. 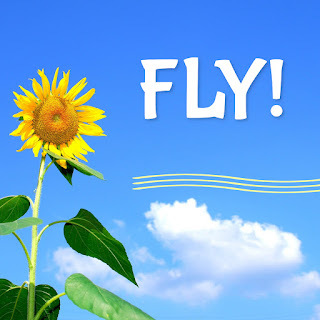 They are made to fly and pollinate. They have work to do! 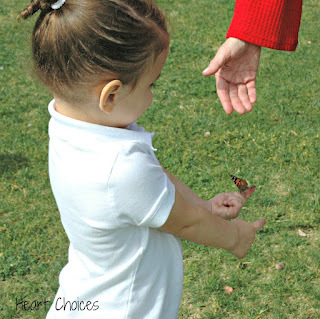 So, we venture outside to release our butterflies. Some take a little longer to realize they are free. They have become used to being cooped up. But once they taste freedom, they are gone. They fly away! How about you? Are you meant to fly? Do you stay cooped up because it feels safer? Are you more like the reluctant butterflies who need a little push to get out there? God has given each one of us talents and abilities. Are you using your gifts? I love how the preschoolers already understand how important it is that the butterfly fly because it has 'work to do!' I can shrink back from doing my work, but thankfully we have a gracious God who continually woos us out of our cocoons! This is a beautiful picture of embracing freedom. Fear can make us shrink back at times but this is a great reminder of the freedom we have and that we were made for more! Visiting from FMF #28. I love teaching little ones about the process of the butterfly.Always faces filled with wide-eyed wonder. I've been away from blogging (and your blog!). Hoping to return soon. Blessings! Such a simple illustration - with a powerful reminder! We are all created for a purpose...and I want to be purposefully using my talents and abilities for His glory!! Thanks for the encouragement! Lovely thought provoking post Debbie. So good to have you back blogging. Have a great weekend!